“Over the last 12 consecutive years, we have committed ourselves 100 percent to becoming champions in ice dance, representing our country on the international stage, and enjoying this incredible journey — challenges and accomplishments alike — together every step of the way. This past season provided us with the most incredible memories, including finishing on the podium at the world championships in Milan. 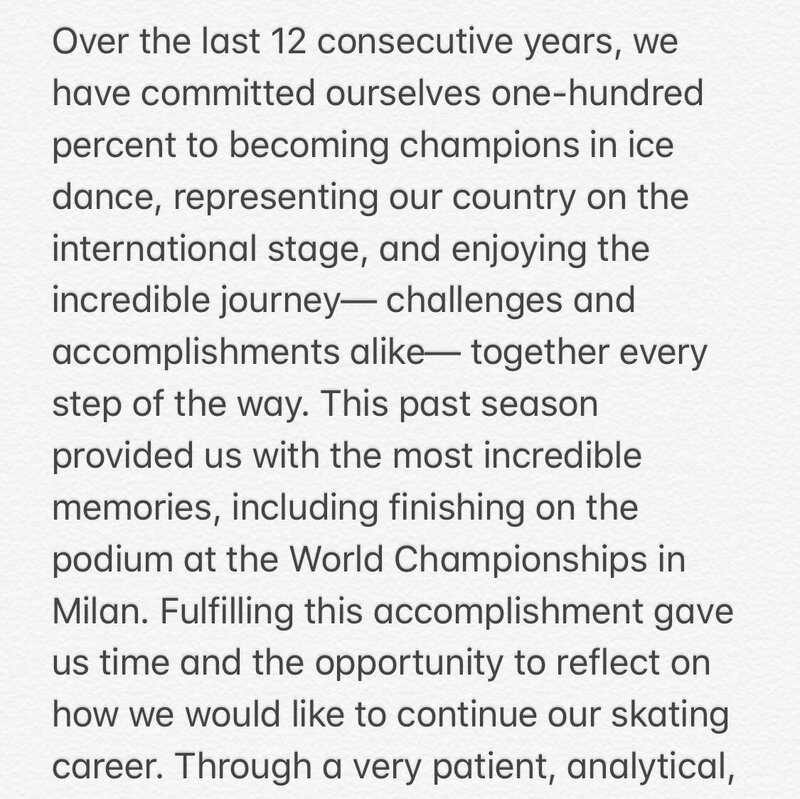 Fulfilling this accomplishment gave us time and the opportunity to reflect on how we would like to continue our skating career. Through a very patient, analytical, and thoughtful process, we have decided to forego the 2018 Grand Prix season. 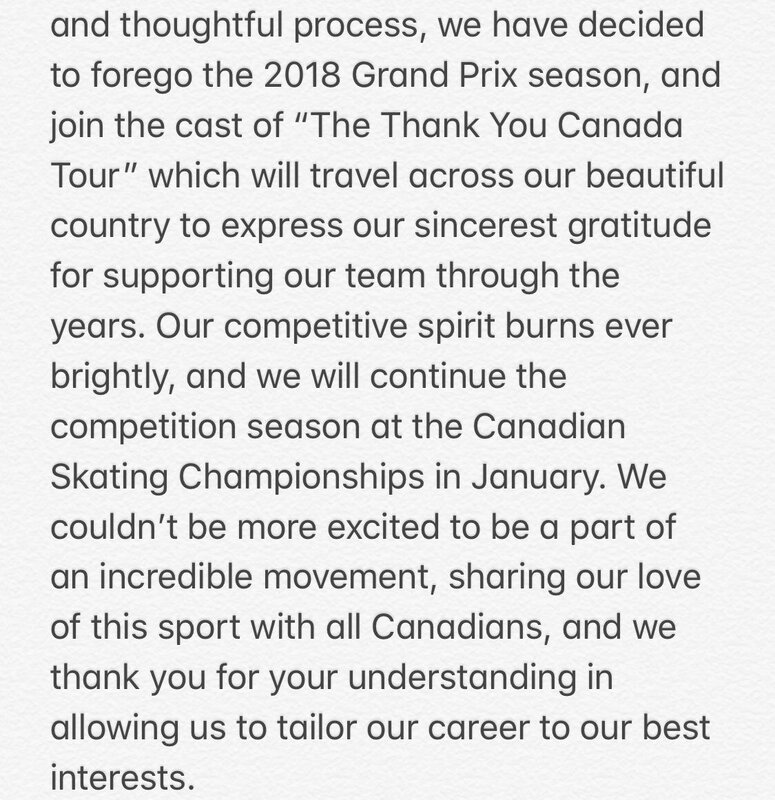 We plan to return to competition at the Canadian Tire National Skating Championships in January. We thank you for your understanding and allowing us to tailor our career to our best interests,” said Weaver and Poje. They have further announced that they are joining the "Thank you Canada Tour"
That's a very moving story. Thanks for the link, although I may have it anyway, since I get Bev Smith's notifications and I haven't checked my email yet this morning. We're supposed to get a lot of rain today, and it's the remnants of hurricane Michael, I think. The storm is mostly off the South Shore in the Atlantic, but we should get a fringe of it. On the radio last night they said we'd get an inch & a half of rain, or something like that in millimetres. So Weaver & Poje won't be on the GP series, but rather doing TYC as a tour. Good for them. Yes, Fred - as posted above they are skipping the GP series but plan to return for Canadians in January. On the tour they are using their rhythm dance and free dance alternately as their programs during the first 1/2 of the show in order to keep them trained and progressing toward competition.